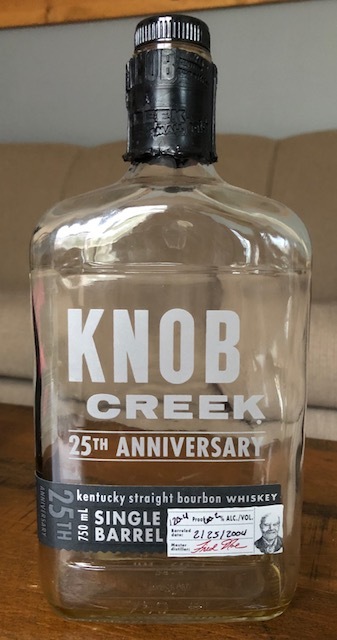 After the somewhat maligned release of their 2001 Knob Creek Limited Edition Batches, which did not get great reviews (due in part to price, I'm sure) and which seemed to sit on the shelves forever (also due to price, I'm sure), Beam released the Knob Creek 25th Anniversary Single Barrel, a 13-year, barrel proof single barrel release to commemorate 25 years of the Knob Creek brand. Although this one also seemed to remain available on the shelves for quite some time (see parentheticals above), it, on the other hand, seemed to get pretty good reviews, so I decided to give it a try. On the nose I got a lot of cinnamon and vanilla. The nose was strong, noticeable from a couple feet away, and was always accompanied by a strong alcohol note. Just sniffing this one you could tell it was a heavy whiskey as far as ABV is concerned. Also hidden in there was a pastry or bread like note, reminiscent of a bakery. That note was understated, though, and the spicy cinnamon and alcohol burn dominated. When it took my first sip, the alcohol was the first thing I noticed. I've had some high proof bourbons that somehow find a way to hide or at least soften that alcohol burn. Not so with this one. There was no escaping it. However, once I waded through the fumes, I found that this bourbon was packed with flavor. The cinnamon was at the forefront, but it had a burnt sugar flavor added to it that added complexity and character, as well as a sort of bitter-sweetness. It was sweet, spicy and toasty up front. It also had a pine note which at first seemed out of place. However, the more I drank, the more I found myself enjoying it. It seemed to work very nicely with the cinnamon and vanilla in sort of a weird, spices and herbs type of way. On the back end the spice seemed to linger forever. This was certainly a higher viscosity whiskey, and it coated every inch of my mouth and throat with that vanilla and cinnamon, which, once the alcohol seemed to dissipate, was rich and delicious. All in all, I found myself really liking this and frequently going back to this bottle once I eventually got around to opening it. 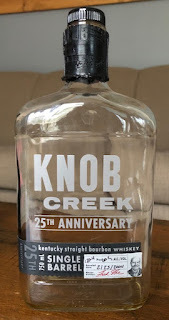 That being said, however, lately there has been a glut of readily available Knob Creek store picks in my area. If I'm in the mood for something with Knob Creek's profile (or even if I just happen to come across one), I'm grabbing those store picks at less than 1/3rd of the cost and, almost invariably, just as tasty. While I appreciated this as very good bourbon, I just can't justify the spend.